It is currently run by Nadine Cunningham who took over from her father. Dalkey Rowing Club has been based out of Coliemore Harbour since the beginning from all records that can be found. The modern Dalkey Rowing Club was founded in 1950. Dalkey Rowing Club has a tradition of winning throughout the 19th and 20th centuries and with great beginnings into the 21st century. Skiff rowing in Dalkey, in common with other East Coast Rowing Clubs, is passed on to us from the hobblers of old. The hobbler men who rowed fishing and pilot boats in Coliemore Harbour and all around the east coast rowed much bigger and heavier boats than the present day skiff. 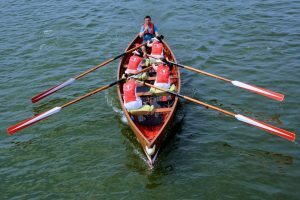 However, the tradition has been passed on from the Hobblers of the 18th and 19th Century to Dalkey Rowing Club and the sister clubs up and down the east coast of Ireland, and is honoured today through the many regattas held up and down the coast during the summer months. 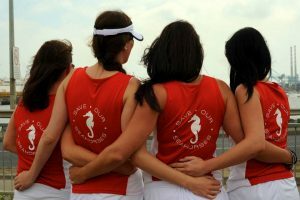 By wearing Save Our Seahorse T-shorts the ladies of Dalkey gave a much needed boost to the campaign and we would like to thank for such a great display and effort.